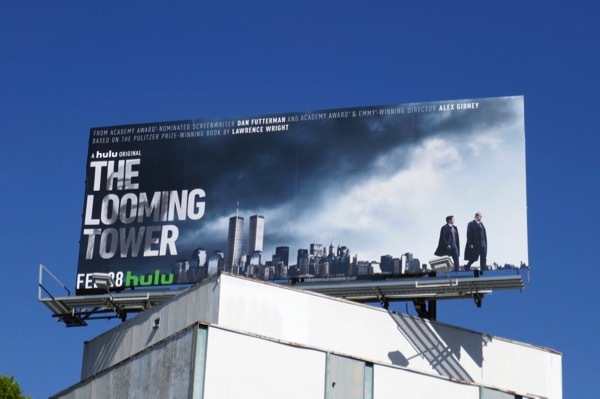 If you thought Hulu's adaptation of The Handmaid's Tale was scary due to its parallels with modern day America, then the streaming platform's latest adaptation, The Looming Tower, may seem even more eerie as it explores the events leading up to the real-life terrorist attacks on 9/11 in 2001. Jeff Daniels, Peter Sarsgaard and Tahar Rahim star in this ten-part drama based on Lawrence Wright's 2006 non-fiction book which chronicle the events and backgrounds of the people who planned the attacks, and how they were investigated by the FBI and CIA. 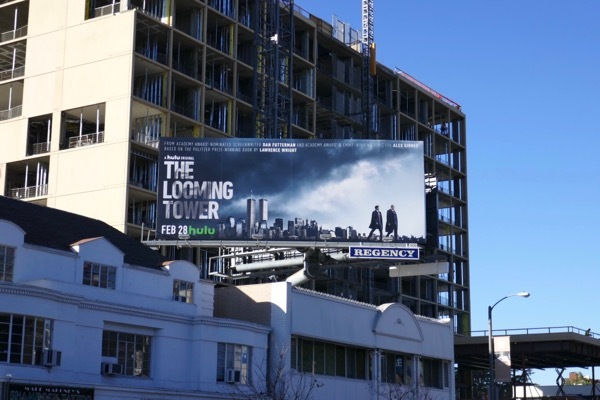 These ominous series launch billboards were snapped along the Sunset Strip, Beverly Boulevard and Santa Monica Boulevard from February 8 to February 11, 2018. 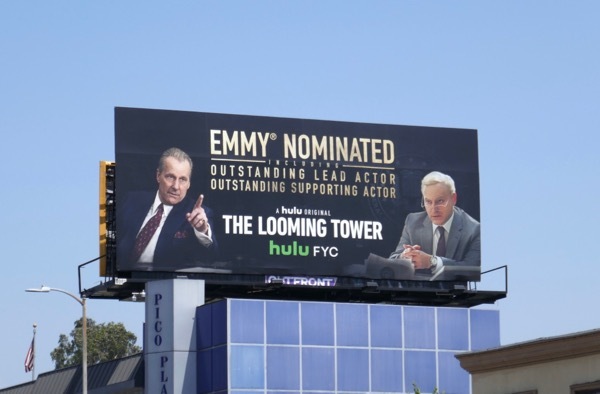 Fans of Jeff Daniels can also enjoy these Dumb and Dumber To movie billboards, these Godless mini-series billboards and the billboards for The Newsroom. 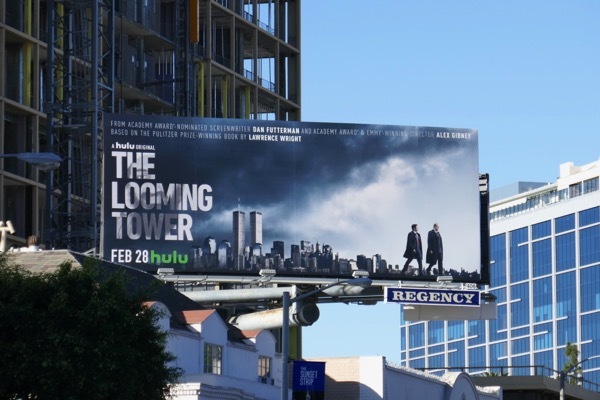 The Looming Tower's subject matter may not be easy for some people to watch, and no one really wants to see Osama bin Laden staring down from a billboard so kudos for his subtle inclusion in this ad design, but sometimes you need to understand your enemy, and yourselves, to help stop history repeating itself. 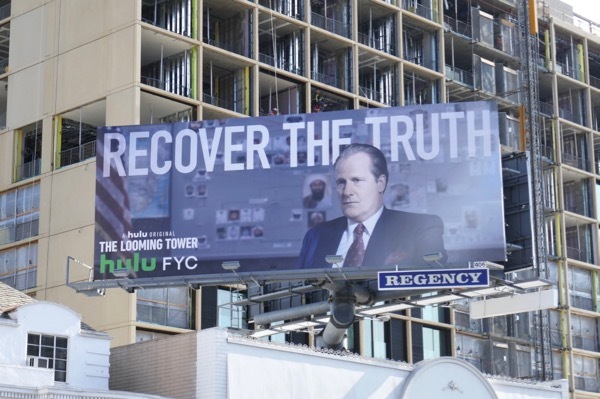 UPDATED: Here's also an Emmy consideration billboard for Hulu series featuring Jeff Daniels, spotted along the Sunset Strip on May 23, 2018. 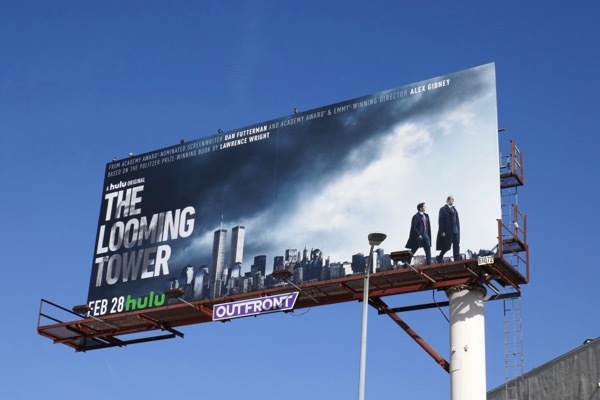 UPDATED: Congratulations to The Looming Tower for receiving four Emmy nominations, including nods in the Outstanding Lead Actor category for Jeff Daniels and Outstanding Supporting Actor category for Michael Stuhlbarg. 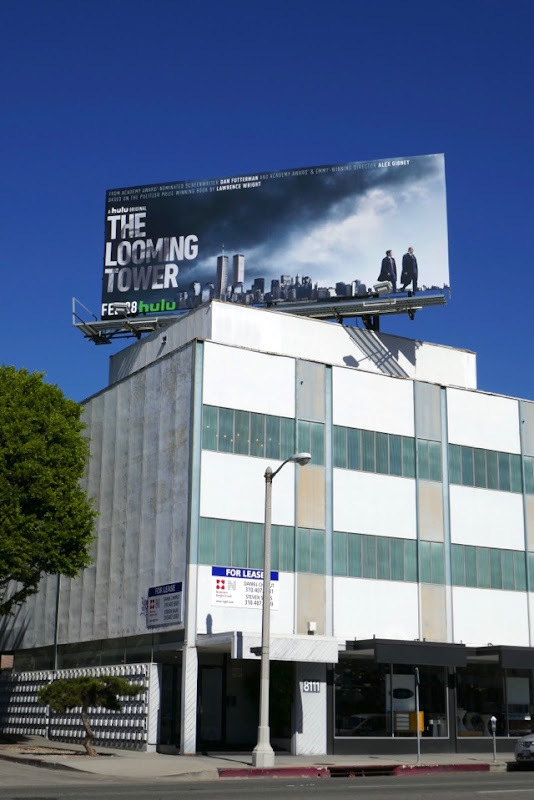 This Emmy nominee billboard was spotted along Pico Boulevard on August 17, 2018. UPDATED: Sadly no Emmy wins for the mini-series, but can The Looming Tower enjoy success at the Golden Globes or SAG Awards this winter season? 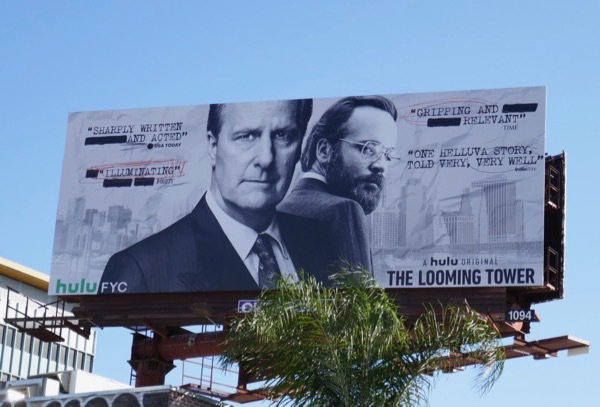 Let's see if this FYC billboard snapped above Hollywood's Cahuenga Boulevard on November 23, 2018, will help.